Step 1 Cut beef cheeks into 1 1/2-inch cubes and place them in a large bowl. Dust the meat with the flour and onion powder, and season with 2 teaspoons of salt and one-half teaspoon of pepper. Step 2 In a high-sided braising pan or oven-proof casserole, heat the canola oil over high heat. Brown the meat on all sides (this may need to be done in batches, as the meat needs to be browned in a single layer and will not brown properly if stacked or packed into the pan), then remove the meat and set it aside in a bowl. In the same pan, add shallots and briefly stir. Add the red wine and stir, scraping any flavoring from the bottom of the pan. Bring the wine to a simmer and reduce by one-third. Step 3While the wine is reducing, heat the veal stock in a medium saucepan until hot. Step 4When the wine is reduced by one-third, add the hot veal stock. Tie the leek leaf, parsley, thyme and rosemary together to form a bouquet garni. Add the bouquet garni and the bay leaves to the pot and bring to a slow simmer, then add back the browned beef cheek pieces and garlic. Cover the pot (leave the lid slightly askew to allow steam to escape) and gently simmer for 3 hours. Step 5After 3 hours, add the onions and carrots to the pot and continue to simmer for 1 additional hour. Step 7Depending on how you want to eat the dish, you can strain the vegetables (for more of a sauce) or leave the vegetables in if serving as a stew. Reduce the sauce if desired for a thicker consistency. In Recipes-list.com we have selected the most viewed recipes from category - Main courses . Enjoy the best recipes specially selected for you! 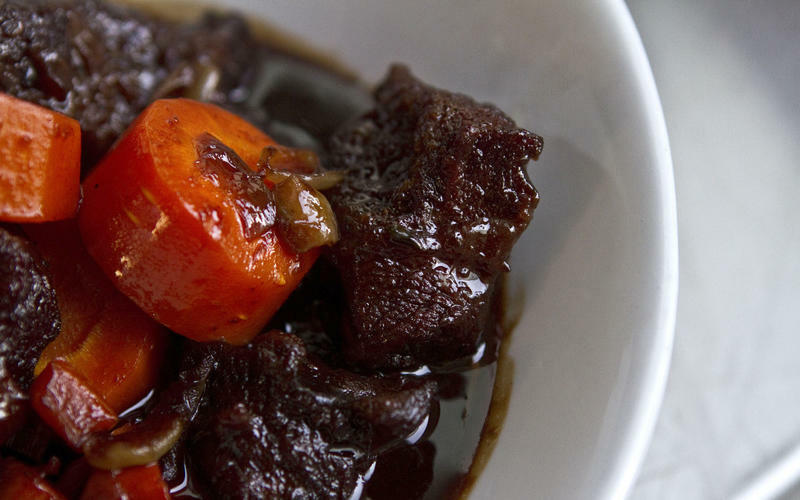 Beef daube is the right choice that will satisfy all your claims.